After nearly a week of fighting, the IDF has completed its takeover of the area stretching between the village of Maroun al-Ras and the town of Bint Jbeil in the central region of southern Lebanon. Golani, Paratroopers, and Armored Corps forces with aerial backup completed the takeover during the night hours. "We are currently occupied with collecting evidence, bodies of Hizbullah terrorists, and various testimonies, while preparing for the next stage, Lieutenant Colonel Itzik Ronen of the Armored Corps' Division 7 said. 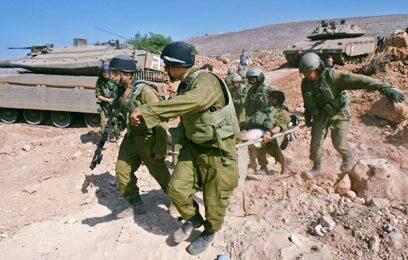 The battles at Maroun al-Ras and Bin Jbeil were in effect the first significant IDF ground operations of the current campaign, and they exacted a heavy toll of nine combat soldiers. During the hours of Tuesday morning, a number of fire incidents broke out between IDF forces and Hizbullah members, but no injuries were reported. The Lieutenant Colonel said Tuesday after the takeover of the area that the new situation enables the IDF to "direct precise fire at every point that is needed (within Bint Jbeil) and to bring the forces to a situation of minimum risk. We know this operation. We can operate in the center of the village or in other places through the soldiers and our means." The IDF is already thinking ahead and knows that forces expect stiff resistance in the coming missions too. Ronen stressed that terror cells intend to drag forces into areas of the village itself, but the IDF is aware of such traps. "We are not letting them do that, we know weaknesses and on the other hand we know our strengths and we use it in the best possible way," he said. Ronen added that the initiative is now in the hands of the IDF but "it could be that there will be more encounters and exchanges of fire. There are still a few dozen terrorists in the area but we have a mission, to minimize as much as possible the rocket fire at Israel and to strike infrastructures – and that's what we'll do. After we complete the first stage, we will be the ones who shape the rules here. The minute we finish the mission we'll leave." During its operations, the IDF is making sure to collect intelligence that allows it to learn about the enemy and to plan better for continued operations. Ronen said: "Until you open the candy wrap you don't know what exactly there is inside," he said. "Now we are in the territory, we see from up close what we are dealing with and we are preparing for it accordingly. We have the best soldiers in the world." See all talkbacks "IDF in control of Bint Jbeil"